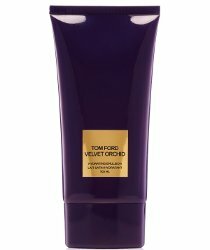 From Tom Ford, Velvet Orchid Hydrating Emulsion: "A sensuous way to moisturize the body. Scented with the ultra-feminine Velvet Orchid fragrance, this luxurious, satin-like body emulsion glides on to help smooth and soften skin. featuring the luxurious touch of velvet flower rich in vitamins and minerals, the beautiful formula moisturizes and helps support a moisture barrier for skin." 150 ml for $56 at Neiman Marcus.